One of the best psychology books I’ve read in a long while is “Depression and Your Child – A Guide for Parents and Caregivers” by Dr. Deborah Serani. Her publisher approached me to review the book, and although I could not review it in the window of time that they dictated, I did eventually make my way through it. The book starts with an understanding of child development, then shows how Depression in children is a verifiable occurrence. Information is given on diagnosing, then treating, Pediatric Depression. Dr. Serani even takes time to cover holistic approaches before moving on to self-harm, suicide, and parenting tips for the present and future. The book features very comprehensive coverage of almost everything a parent could wish to know about Pediatric Depression. Dr. Serani also advocates cognitive behavior techniques in tandem with medications, giving examples of how to shift negative thinking and help children retrain their minds while being supported by family, counselors, or therapists. As many of my readers are aware, I treat my Depression without medication. It is a difficult process, but one that was forced onto me. There is a considerable amount of stigma surrounding non-medicated treatments for Depression. I have been told by other depressives that I don’t truly have Depression if I can overcome it without meds, or that my solutions are unique only to me and useless for the general public. On the flip side, I have people who don’t understand clinical Depression who insist that I’m simply too negative and that if I only thought positively I would lick this thing. The medication missionaries see their way as the ONE TRUE WAY, and those who deny the existence of clinical Depression take a vital tool (positive thinking) and trivialize it to the point of uselessness. It can be discouraging to be marginalized by both extremes out there, but fortunately, I have persevered. I felt it was important to be an advocating voice for those who cannot utilize traditional psychiatric treatments (i.e. medications) to alleviate their condition. These suffering souls need to know that there are other ways to take their life back and push off the black dog. This is why I approached this book so carefully. Most books on Depression favor only medicated treatment. I was surprised to discover that wasn’t the case here. I can’t say that I agree with every alternative therapy that Dr. Serani covered, but I was thrilled by her respectful tone. It is clear that she has a dog in the psychmed fight, and the section on alternative therapies is a small part of her book, but unlike so many other experts in the field, she was willing to consider the upsides and efficacies of alternative therapies. In fact, she gave me great ideas on the use of colors and scents for fighting Depression. I know. It sounds a little bit flakey, but she put into words concepts that I had been playing around with in my mind and showed them to me as fully actualized solutions. I approached this book with so much suspicion, but was rewarded over and over again for my effort. If you have a child suffering from Depression as I do, you will find this book invaluable. It will give you the terms and processes you need to understand to better help your child. Dr. Serani’s expertise as a psychiatrist came from years of treating children like your own. Each chapter has a clear theme and includes a case study of Dr. Serani’s at the end giving an example to how the concepts in the chapter affect children and parents in real life. The book is exhaustive in the material it covers, and for the most part does an excellent job not inundating the layman with mental health jargon. 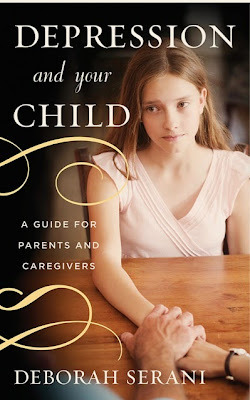 If you are nervous about medicating your child until they are older, this book is a great guide for you to follow. It is the untreated child who receives no help that struggles the most. Treating a child doesn’t necessarily mean medicating them, though many parents do find that path the best one. “Depression and Your Child – A Guide for Parents and Caregivers” by Dr. Deborah Serani is loaded with advice and information to help you chart a course through these turbulent waters that will get your child the help they need to manage their Depression and get the tools they need for the rest of their life.